The New One! 20 wins and counting! The indomitable THE NEW ONE and the electrifying UN DE SCEAUX! Both now in the 20 career wins club and both now also in the one million+ career earnings club. Warriors like those two 10yo’s are the reason our love of the jumping game never dies. They keep coming back for more and so do we. Both deserve their own statues upon retirement, however far in the future that may be! It was clear for all to see that the mass removal of the Rooney horses a couple of seasons back left a bit of a hole in the McCain yard and had a significant impact on not only his numbers but also, probably, his confidence. Those runners were at his happy hunting grounds of Musselburgh & Haydock and it’s the north circuit where he’s building his reputation back up to where it should. He currently sits 10th in the trainers standings but if you switch it to number of winners (as opposed to prize money won) he sits a rather impressive fourth, with 74 winners currently to his name, only Skelton, Henderson and Nicholls have trained more winners than him this season. During his ‘peak’ years, when the National winners and Cheltenham Festival winners/contenders were ‘in abundance’ (circa 2010 – 2015) he was banging in 100+ winners in a season, peaking at 153 in the 2011/12 season. The season of the Rooney exodus (2015/16) he dipped to a paltry (by his standards) 53 winners and followed that up with a slightly better haul of 80 winners in the 2016/17 season, still below the 100+ winners he was getting used to banging in, however. With 74 winners already on the board this season by mid-January he’s almost certainly, baring disasters, going to surpass the 80 winners of last season and, hopefully, he’s on track to re-join the 100 club. It has to be noted that not only did his figures take a hit with the loss of the Rooney horses but he also lost his stable jockey Jason Maguire at around the same time. For me Maguire was an integral wheel in the McCain cog and the retirement of the jockey probably had as much an impact on the McCain winners as the loss of the bulk of his string. He has since found a replacement in the shape of Will Kennedy and although that partnership is doing some serious damage to the scoreboards (42 of his 74 winners this term have been ridden by Kennedy) it’s the emergence of another jockey on the McCain riding roster that’s catching my eye, a certain BRIAN HUGHES. …since the start of 2017. If I’m honest I’m not entirely sure of the exact riding arrangements between McCain, Kennedy & Hughes, there seems to be more to it that Hughes just picking up a couple of spare rides here and there, but whatever is going on is certainly working wonders. …and that monster’s name is DORTMUND PARK. The big, raw 5yo sluiced through the mud at Thurles on Sunday to record his second hurdling success of the season and his fourth win from five career starts. Conditions at Thurles were borderline unraceable but that didn’t stop the Elliott youngster from cruising through the contest and pulling away down the home-straight to record an impressive 16L victory. He’s improved significantly for a step up in trip (Sunday was over 2m6.5f) and the application of a tongue-tie (TT worn on last 2 starts) and although it looks all about chasing with him it’s not hard to see him running well in some of the top novice Graded Hurdle races come the end of the season. Dortmund Park struggled a bit on the heavy ground. He’s a big raw chaser and one for the future. Dortmund Park is a nice horse and I think there’s more improvement in him. He won’t be out of place in graded company. The ground was a worry, we think a fair bit of him. So by all accounts they’ve been worried about the heavy ground on his last two starts! If that assessment is correct and he will indeed appreciate less cut underfoot then this lad could truly be a monster in the making! When he meets with 3m and fences he could be something special but I certainly won’t be surprised should he add a couple more hurdle victories to his CV prior to that. I think we can all agree that Nicholls has just lacked a Kauto Star or Denman type figure in recent seasons. Sure, he’s had plenty of high quality animals to work with but the real superstars are just not quite there at the minute. In the form of weekend Taunton scorer DAN McGRUE, however, he may just have something well above average bubbling. 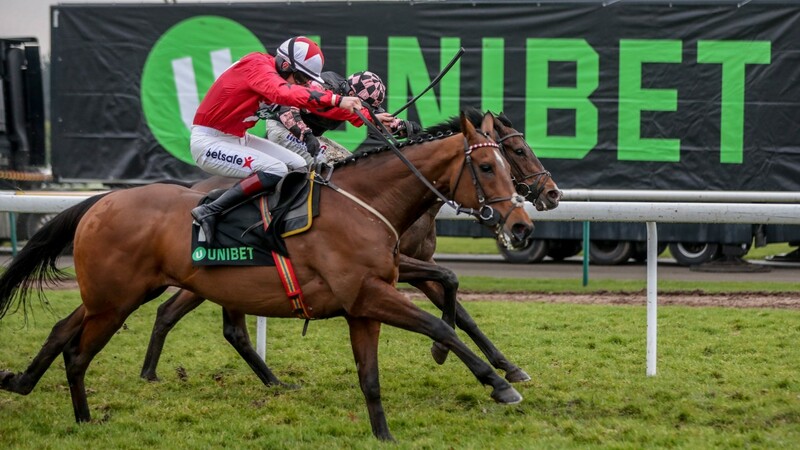 The 6yo was impeccable in the jumping stakes in the 2m3f Novice Hurdle at Taunton on Saturday and as soon as his jockey Bryony Frost pressed the button on him to go on and win his race turning for home, the race as a contest was over in a matter of strides. Sure he probably didn’t beat much but the manner in which he did it was highly impressive and his jumping was just…WOW! SO quick, accurate, neat, nimble and fluent and apart from the last, where the race was already won anyway, his jumping was simply a thing of beauty. He’s being kept close to home at present (his four runs since joining Nicholls have been at Taunton & Wincanton) and not being tested at too high a level, but I don’t mind that, Nicholls is clearly just giving the horse time to find his feet under rules and letting him develop and mature at a natural rate without pushing him too quickly. Chasing seems the plan for him next season and if he translates his hurdling technique to fences, and there is no reason why he won’t, he could be very special indeed. I like him a lot. Brave to play the future chaser thing esp with a 6 yo and one already in a TT. Question in general to jumps fans, and you mentioned Kauto, why wait so long to go chasing and given jumping since 4 mostly why avoid championship races? Many Irish bred jump P2P jump fences at 4 then spend 3 years taking fees as future chasers off gullible owners as flat horse (!!! ), Novice Hurdlers and some even waste a year hurdling properly (v opposable as novice chasers) and indeed even at 6 or 7 with a championship race for the taking opt for some novice title that is almost inexplicable to new fans – the champion horse at x who had not won at x in the prior life championship of the world – the IBF is more credible. i.e. TNO UDS exceptions but… Vautour won the tin plate Ryanair for all the hot air. Simonsig the Morebattle Hurdle beating a future grade 1 winner [Knockara!!] and Douvan has won some nice races in Ireland. Coneygree may only have made 1 championship race but Vautour and Douvan turned down easy wins that year to win tin plate instead of a novice clean sweep. Maybe just a slow maturing type, not too concerned by him being a 6yo, Don Cossack didn’t start chasing until a 6yo and he also ended up with a TT, so in Elliott I trust. Hard to answer your main point and I guess many trainers take the route that allows the horse to progress best and don’t rush it before it’s ready. Most horses come from the P2P world pretty unfurnished and with plenty of growing still to do (I imagine), stick them over proper fences before they are ready and a good horse could be ruined by impatience. Is there a micro angle to McCain and Hughes? I like following Hughes but don’t like doing it blind. I follow Josh RTP with McCain so an angle Hughes as well may just give me a bit more confidence. Cheers Ben will look out for that angle.